British number one Johanna Konta says playing three home WTA grass-court tournaments this summer gives her a "perfect pathway" for Wimbledon. Konta, 27, has confirmed she is set to return to the events in Nottingham, Birmingham and Eastbourne in June. Wimbledon, where Konta reached the semi-finals in 2017, begins on 1 July. "Nothing compares to competing at home with passionate fans, friends and family behind you," said Konta, who is ranked 38th in the world. Konta, who has played all three tournaments in the past four seasons, has enjoyed notable success on British grass. As well as reaching the Wimbledon semi-finals two years ago, eventually losing to five-time champion Venus Williams, she has finished runner-up at Nottingham for the past two years and beat then world number one Angelique Kerber at Eastbourne in 2017. 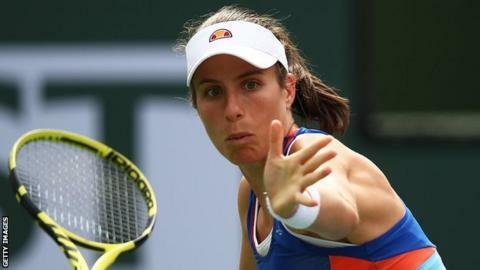 "There is always a strong player field at Nottingham, Birmingham and Eastbourne with no easy matches," added Konta, who reached fourth in the world after her Wimbledon exploits. The Nature Valley Open starts in Nottingham on 8 June, followed by the Nature Valley Classic in Birmingham on 15 June and the Nature Valley International in Eastbourne on 21 June.